Fugetek FG-637 -- World's Worst Projector? Home / Projector Reviews > Fugetek FG-637 -- World's Worst Projector? The Fugetek FG-637 is a widescreen projector with a native resolution of 800x480 and a claimed light output of 1500 or 2000 lumens, depending on which part of the spec sheet you read. It claims to be the "most affordable HD supported LCD PROJECTOR on the market," and it sells at the moment for $179 on Amazon. Its affordability aside, we can say that anyone who wants a projector can't afford to waste their money on this piece of junk. Simple picture controls. The FG-637 has some basic picture controls that allow you to adjust brightness, contrast, sharpness, tint, and saturation. All settings run from 0-100, though most have a smaller "effective range" past which no further change is possible. Handles HD signals. The FG-637 didn't choke when we fed it 1080p/60 and 1080p/24 from our Oppo BDP-103. The scaling is sometimes rough around the edges, and the fine detail of a good HD signal is lost in the projector's low resolution, but the signal itself makes it to the screen just fine. 20,000 hour LED lamp. Light emitting diodes last much longer than conventional lamps -- at least in theory. Whatever the light source used in the FG-637, and whatever its lifespan might be, the build quality of the FG-637 makes us doubt that it will still be working in 2,000 hours, let alone 20,000. Incredibly dim. The FG-637 claims to produce "1500 lumen (2000 peak value)." This is a slight exaggeration. We measured 87 lumens. We don't know whether the lumen spec is simply a huge error or intentionally deceptive advertising, but this thing is dim. You wouldn't want to watch it in anything but a pitch-black room, and even then screen sizes over 60" diagonal are a bad idea. Very poor uniformity. Not only does the projector not produce much light, but the light that it does manage to deliver is unevenly spread across the screen. The FG-637 measured 48% uniformity, meaning the picture appears vignetted and has a visible, obvious hot spot in the center. World's Worst Screen Door Effect. I had always thought that the term "screen door effect" was something of an exaggeration. On most projectors, the inter-pixel gap isn't large enough to actually look like a screen door, though there might be visible pixel structure. The Fugetek FG-637 has corrected my error. Watching this projector, with its massive inter-pixel gap, is exactly like watching through a screen door. It has the worst SDE ever; we don't even recall VGA projectors from the 90's looking this bad. Super low resolution. At 800x480, the native 15:9 FG-637 is a step below SVGA. This resolution is still commonly seen in battery-powered pico projectors and some low-priced cellular phones -- both of which produce images smaller than those seen in home theater, making the low resolution less of a concern. Always-on overscan. When a projector adjusts the input signal so that the edges of the image are cut off, it is called overscan. Most home theater projectors retain this option, but it is just that -- an option. On the Fugetek FG-637, the picture is overscanned at all times. What's more, the overscan isn't the same all the way around the image: the left side of the picture is cropped more than the right side. Even worse, the scaling is visibly irregular, so items on the left side of the picture look stretched out, while items on the right side look relatively normal. There is no way to fix any of this, because the projector does not allow you to adjust geometry or aspect ratio. Picture controls don't work. In addition to the Geometry menu that can't be accessed, the projector has other control problems. Sharpness goes from 0-100, but only 0 and 1 do anything, so in reality it is a binary, on/off control. Setting sharpness to 0 disables edge enhancement, which gives you the best picture this poor little projector is capable of. Setting sharpness to 1 makes the picture look terrible and puts fat white halos around everything on the screen. To make matters worse, once you turn sharpness off, the projector keeps turning it back on with every change of a setting or source. That's right: if you set Sharpness to 0, then change to a different DVD or otherwise alter the input signal, the FG-637 will re-enable edge enhancement. But the sharpness control will remain at 0. To disable enhancement, you have to move the control back up to 1, then down to 0 again. The Fugetek FG-637 has a secret. When you start it up, the splash screen shows the "iDGLAX" logo of Digital Galaxy, the makers of the DG-757 and other cheap projectors. Yet the Fugetek FG-637 is not sold under the Digital Galaxy brand. Regardless of who makes it, we would never recommend that anyone buy it for any reason. You can get MUCH better projectors for not much more money. 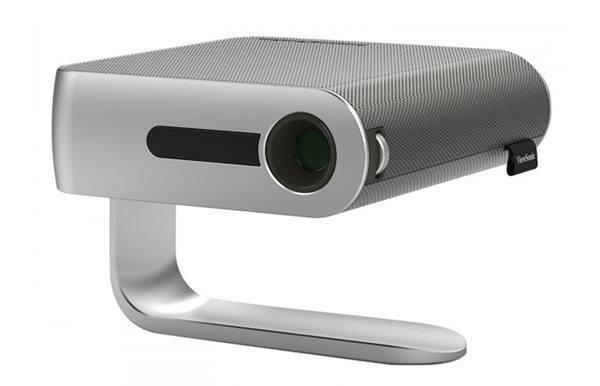 Those looking for a cheap projector might want to check out the BenQ MX503. Though it sells for almost $300, that extra $120 buys you a lot more performance. The MX503's native XGA (1024x768) resolution gives it a sharper, more detailed image than the FG-637. The MX503 also has a drastically smaller inter-pixel gap, so there is almost no screen door effect unless you are sitting with your nose to the screen. And that's not recommended, because the MX503 at 2700 lumens is several orders of magnitude brighter than the FG-637. (Unlike the FG-637, BenQ projectors actually come close to their lumen specs). Black level is much deeper, and the image as a whole is higher in contrast. All in all, it's a much better picture for both presentation and video. The MX503 has a 1.1:1 zoom lens, so placement flexibility is still somewhat limited, but even that small adjustment range makes it easier to use than the FG-637, which has no zoom at all. The MX503 has an internal 2W speaker as well, so onboard sound is available if you don't feel like hooking up external speakers. In the end, Fugetek FG-637 gives you an amazingly dim picture with bad uniformity and worst-in-class screen door effect. Considering this is a cheap projector, flaws like these are understandable. But then add to that the geometric distortion and overscan that can't be fixed, and the terrible edge enhancement that won't stay disabled, and you've got the worst projector we've ever seen. Crippling bugs like these make the FG-637 a projector that nobody could love. Admit it Bill. You really enjoyed getting that out of your system. Wow! I've never heard you guys knock something, but then, somewthing like this projector fortunately only comes along once in 20 years?? Found your review very entertaining. Fugetek sounds like a failing company for sure. The next generation (if the company is still around) FG-638 should be an interesting read. That was enjoyable to read...but you were too nice. Haha, I had to look this up on Amazon just to see... mostly 4* or 5* reviews. I guess some people are still just impressed by a large picture and dirt cheap price. Understandable for the ones who got it for kids, at least.